Communication Nation: My sessions at VizThink: What do YOU think? I plan to attend your session, so glad to take the opportunity to give some feedback. 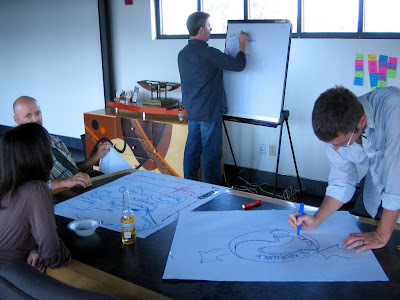 I added your idea to the list, under the heading "How to sell visual thinking." Thanks for the thought! I think this is interesting so i will give you my brainstorming case! I would like to see how we can help corporate teams that produce information they post up on the website (in our case a financial services and wealth management company) to complete re-think text and generate much more visual representations of content....so much of the financial stuff is dry, take lots and lots of words to explain...but I believe for web consumption, diagrams and visual representations work much better. We have a further challenge _ a brand that specifies photos for all imagery!!!!! EEEK! How to get around this..? Meaning how we are going to actively incorporate VisThinking in our life/community? Build a structure, daily/weekly routine, habit. Such as "take 60 min a week for necessary solitude to specifically practice my visual thinking..."
MsMaverick and Joanne: I added your ideas to the post above, thanks! I want internet marketing skill and so for that share with me all the skills what i require. I think the idea of reworking Power Point presentations is a GREAT idea! People in all industries are now expected to use this tool to present ideas but just about all are poorly done. I will be attending your workshop on Saturday. I'm very interested in using visual tools to engage non-English speaking groups. I manage teams in Asia and Europe and we often forget to present our ideas in ways that will appeal to non-english speakers and in metaphors/visuals that are language agnostic. I'd love to see at least part of your session cover this idea. And as a "hyper-verbal" person, I wonder if you can address the idea of visual literacy. We generally know what it means to be a literate person but what does it mean to be fluent in visual ideas and what are the fundamentals that everyone should know if they want to be visually literate: basic composition, color theory, drawing skills? These are great topics Matthew. Metaphors can be especially tricky in cross-cultural environments. Both this and the topic of visual literacy are likely to come up in the podcast I'll be doing with Tony Karrer next week. Hope you can join us!